Using an iPad-mounted Structure Sensor and Skanect 3D Scanning Software by Occipital, LTS staff and student interns transformed Wellesley students into miniature 3D statues. After being scanned, students could choose to accessorize their virtual digital portrait with digital props (such as hats and cat ears) constructed in the user-friendly, free, web-based 3D modeling software, Tinkercad. Once their virtual digital portrait is ready for printing, it is exported as a MakerWare-compatible file to print on Library & Technology Services' MakerBot Replicator 2X 3D printers. 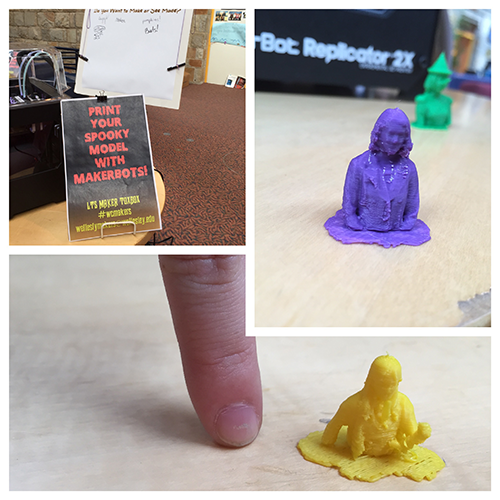 3D portraits have been a popular attraction at Maker Toyboxes and other LTS-sponsored events around campus.